As powerful Typhoon Soulik is quickly approaching the Korean Peninsula, most parts of the country will see cloudy skies with heavy rain Thursday. As of 6 a.m. Thursday, the typhoon was located 90 kilometers northwest of Jeju Island, with winds of up to 39 meters per second. It is expected to pass through Seoul on Friday morning. 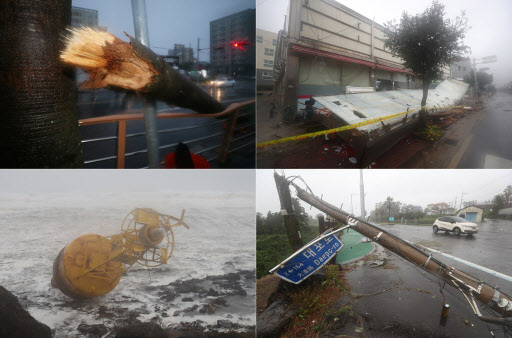 The Korean Meteorological Administration has issued typhoon warnings for the southern part of the country, including Jeju, Jeolla and South Gyeongsang provinces. More than 400 millimeters of rain are expected to lash the southern coast of Korea and Jeju Island until Friday, while South Jeolla and South Gyeongsang provinces will receive up to 250 mm of rain. Seoul, Gyeonggi Province, South Chungcheong Province, North Jeolla Province and North Gyeongsang Province will receive more than 200 mm of rain until Friday. Regions in North Gyeongsang and North Chungcheong provinces will also receive 30 to 80 mm of rain. The heavy rain will cease from Friday afternoon. The daytime high nationwide will hover around 28 to 32 degrees Celsius, which is about 5 C cooler than Wednesday’s temperature.